Oklahoma, a state with numerous ties to the controversy over Missouri's lethal injection procedures, on Tuesday night botched what the state had hoped would be the first of two successful executions. According to reports of witnesses, Clayton Lockett writhed in pain on the gurney after he awoke following a doctor's declaration that he was unconscious. He died of an apparent heart attack at 7:06 p.m., more than 40 minutes after the first drug was injected at 6:23 p.m.
Robert Patton, director of the Oklahoma Department of Corrections, said Lockett's vein had collapsed. Without effective sedation, the second two drugs are known to cause agonizing suffocation and pain. Mr. Lockett’s apparent revival and writhing raised questions about the doctor’s initial declaration that he was unconscious and are sure to cast doubt on the effectiveness of the sedative used. The bungled execution in Oklahoma happened after months of controversy that in many respects mirrored the dispute in Missouri. 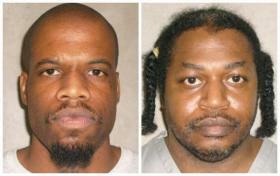 Lawyers representing death row inmates have called on Gov. Jay Nixon to halt Missouri's executions, in light of Oklahoma's failure. Like Missouri, Oklahoma has attempted to shield the identity of its drug supplier from scrutiny. Oklahoma has also used compounding pharmacies in the past to supply its drug. As we have reported in the past, compounding pharmacies are not regulated by the Food and Drug Administration and their products have a significant failure rate. Medical experts have testified that hiding the identity of the supplier is dangerous for the inmate, and provides no opportunity for public oversight. What's more, as we revealed in December, Missouri had turned to a pharmacy that wasn't licensed in the state and had been cited in the past by regulatory bodies. That pharmacy was located in Oklahoma. At this point, it's unknown who made the drug Oklahoma used last night, and whether it was compounded or manufactured. Gov. Mary Fallin has called for an evaluation of the state's methods "to determine what happened and why during [the] execution of Clayton Derrell Lockett," she said in a statement. Missouri and Oklahoma also both hide the identity of those who carry out executions. A 2007 investigation by the Post-Dispatch discovered that Missouri's anesthesiologist had numerous malpractice suits brought against him, and that he sometimes got confused about the dosages. In Missouri, Department of Corrections staff administer the drug with the supervision of medical personnel. Although the two states utilize different drugs, emails show that staff from the attorneys general in Missouri and Oklahoma, as well as other death penalty states, routinely share information on the drugs. The two states are so similar, in fact, that Missouri Attorney General Chris Koster cited Oklahoma as a reason more information about our drug supplier should be kept secret. This execution will undoubtedly renew the call by many for more scrutiny in how states carry out executions. In a statement, the governor's office told us that he "continues to support the ultimate punishment imposed by juries and courts for the most merciless and violent crimes." When asked whether this will cause a change in Missouri's methods, a spokesperson for the attorney general's office said that "in Missouri, a board-certified anesthesiologist and an I.V.-certified nurse are part of the execution team and establish the I.V. line by which the chemical is administered." But documents obtained by St. Louis Public Radio show that Oklahoma's protocol also calls for a physician to be present during the execution. The Missouri Department of Corrections did not return a request for comment.